Like all other career paths, cracking the hottest job of 21st century is mainly about gaining knowledge and developing important skills relevant to the job. And your resume should reflect all these skills. So what must the resume of a professional data scientist look like? 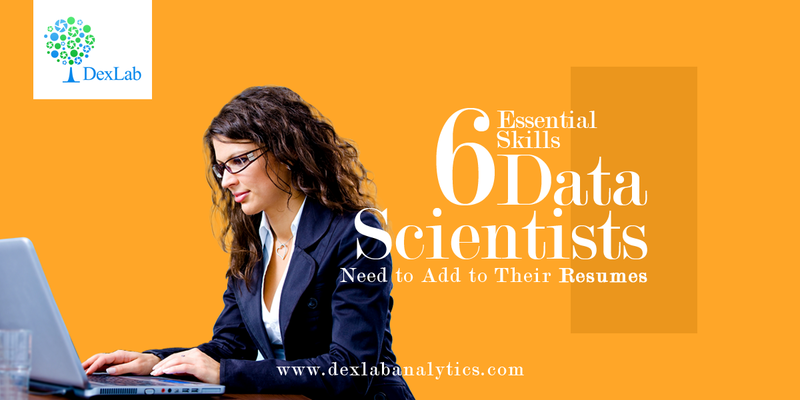 Here are 6 key skills that must be in the fingertips of a good data scientist. Not only blue-chip tech companies, even medium and small scale enterprises are operated by data science these days. And statistical knowledge is vital for that. You should be thorough with general statistical concepts, like distributions, tests, range, likelihood estimators, etc. In mathematics, one must know the basics of linear algebra and multivariable calculus. This will definitely make a difference in your work outcomes as it enables you to improve predictive presentations. Simply put, being good at coding is a must. So, if you are a budding data scientist you must actively work towards developing a computing mind; you should be able to understand, write and even analyze code whenever necessary. This level of dexterity only comes through meticulous study and practice of not one, but a number of programming languages. If you want to develop a programming skill which is especially designed for data scientists, then get enrolled for R programming certification. Over 40 percent data scientists prefer R for solving stat problems. But it must be noted that R isn’t easy to learn, especially for those who aren’t comfortable with codes. Python is another language which is highly preferred by data scientists because it is very adaptable and hence, can be employed in all the different steps part of a data science project. Moreover, data sets can be created with ease and SQL tables can be imported into working codes when required. Considering these benefits and the fact that over 50% data scientists favor Python, an excellent Python Certification in Delhi should be first in your list of courses to undertake. Learning isn’t effective unless you implement it practically. Moreover, your skills get duly appreciated when it’s demonstrated. Hence, always look for live projects you can join and try to understand the data architecture behind the screen. It may be up there in your head, but it needs to be implemented. Large companies actually prefer candidates who have more practical experience rather than just bookish knowledge. Unstructured data is any type of content that doesn’t fit into traditional database tables. These data types aren’t well organized and hence, sorting them becomes very difficult. Blogs, videos and customer reviews are some examples of unstructured data. Being able to manage unstructured data is an important skill for data scientists. Apache Hadoop, NoSQL and Microsoft HDI insight are some good software for tackling unstructured data. If you are interested to learn the techniques, you can look up the course details for Hadoop certification in Delhi at DexLab Analytics. Data scientists might have to work with complicated models and datasets, but they must know how to express their deductions in lucid language that’s simple and engaging. Hence their raw data must be expressed in the form of tables, charts and graphs, which are visually appealing and can capture the attention of stakeholders. A strong educational background is the door to the world of data science. Big companies prefer applicants who are master degree holders in either stats or math or computer science or physical science. Data science is definitely the trendiest job and you might be eager to land one, but it’s not easy to acquire the above mentioned skills. If you are looking for guidance from experts who have previously worked in this field, then you should get enrolled for Data Science Courses in Delhi right away. The industry experts at DexLab Analytics tailor the courses to the unique needs of students and incorporate ample practical cases to help them get ready for the challenges ahead.